From here, 389 metres above Palace Square, there's a fantastic view over the whole region – all the more reason to stage outstanding events here. Enjoy the view from Stuttgart's highest event venue! Impress your guests with an event in a unique ambience. 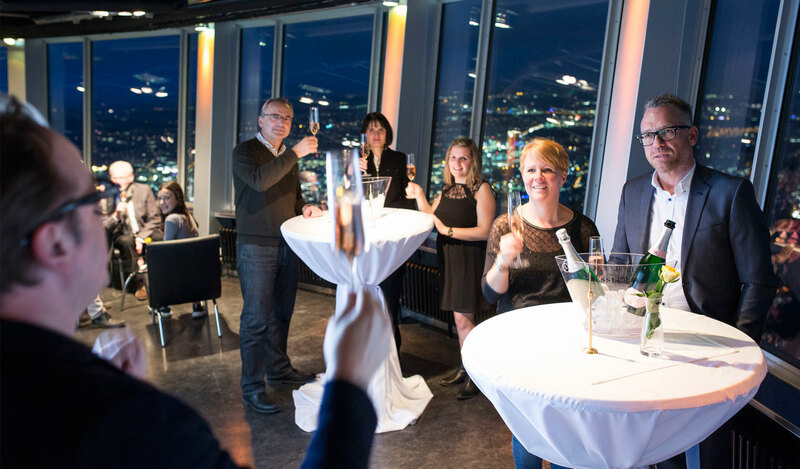 At a height of 144 metres over ground level you'll find a location in the Stuttgart Television Tower that can't fail to enthuse. The event level can be hired for both corporate and private functions and accommodates up to 68 guests. Variable fittings allow the round event area to be used in a diversity of ways. The spectrum ranges from business presentations and conventions to stand-up receptions and a cosy lounge ambience, theatre performances or concerts. You can also enjoy a high-class gala dinner here. Catering can be conveniently arranged through the Tower restaurant, Leonhardts. It can provide everything from drinks for conferences and nibbles, to a multi-course meal arranged to meet your own specifications.